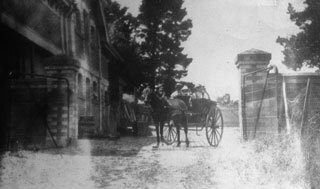 St. Agnes was part of a vast area squatted on during the 1830’s, by Charles Ebden, who brought herds overland from NSW. It is steeped in history, as it goes back to the first settlement of the area. 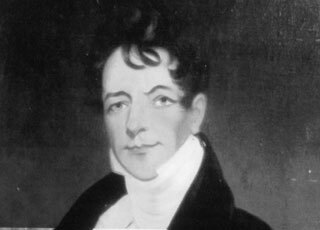 Mr. Richard Wedge arrived in the district in1835,and took up the land which included St Agnes Station in 1838. 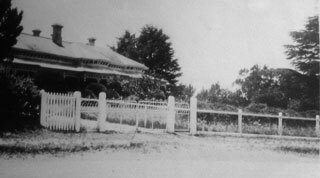 By 1840 he had over a thousand sheep and fifty head of cattle and had constructed a weatherboard and shingle homestead on the banks of the Campaspe; a few hundred yards from where the present homestead is. 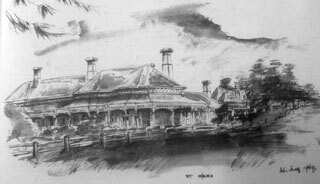 In 1840 he sold the station to James Donnithorne,who had come originally to the Port Phillip district from Calcutta. The station was managed by Mr. Ward,who spent far too much on ‘improvements’ causing an acrimonious split and consequent sale of the station to Edward Argyle and Nathanial Booth in 1850. At that time St Agnes station “comprised all the country lying between the Campaspe and Coliban Rivers,from Carlesruhe to Malmsbury ..it was a vast holding! St Agnes was run in partnership until 1853 when Edward’s sister came from Scotland and married his partner Nathanial Booth. They were given a section of St Agnes homestead and the land surrounding it, as a wedding present. A small hamlet grew around the homestead of Edward Argyle who had built Rock House on the hill behind. 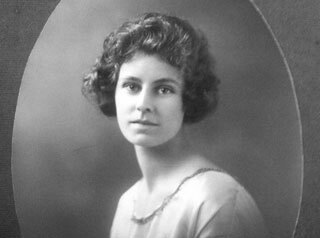 It is still called ‘St Agnes Hill ‘and predated the township of Kyneton which was established on the other side of the river. Edward’s son, later became Sir Stanley Argyle, Premier of Victoria. St Agnes homestead also prospered,as it lay on the route to the goldfields in Bendigo and the diggers were supplied with meat and grain… there are still old bluestone Mills (Ward’sMill) (Degraves Mill) in the area. During the 1870’s, a splendid formal wing was added on a grand scale with all the features found in a Victorian home of the era. There were high ceilings,deep bay windows,elaborate cornices and ceiling roses,marble fireplaces, cedar doors and beautifully executed graining on doors, windows and skirtings. 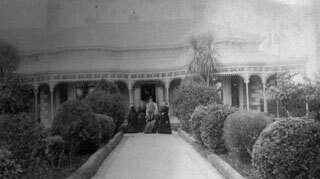 The verandahs had lacework and the facades had beautiful tuck-pointing. A huge 2 room cellar included an area for hanging meat,a wine store and 4 inch thick slate bench to keep diary products cool. The two storey 25 square brick stables were built in the 1870’s with three stalls for carriage horses and a stallion stall,as well as a tack room with a fireplace to keep the saddles warm! The extensive lofts were once used to store hay with trapdoors to drop the hay straight in to the stalls below. A huge cobbled courtyard is enclosed by a brick fence and a delightful small outbuilding was used for doves. The Argyles, Booths and their descendants lived at St Agnes well into the 1950’s. It has benefited from benign neglect which saved it from being ‘modernised’, before its Victorian features could again be appreciated. During the 1970’s, Tom Lazar, the restaurateur and vigneron, lived at St Agnes for 7 years and pressed his first vintage of ‘Virgin Hill’ wine here. In the late 1970’s St Agnes was bought by Horace and Dorothy Samford,former concert musicians who were the founders of importing firm Samford and staff who imported Aga, Gaggenau appliances. The beautiful Super wilton carpets, hydronic heating ,country kitchen and antique furniture made it a very comfortable residence. In April 2000, David and Waltraud ( Traudi) Bibby,became the new owners of the historic,heritage listed property. 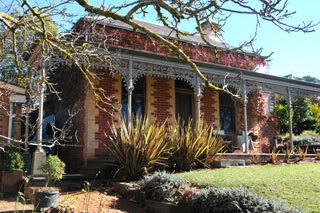 They loved the historic town of Kyneton, in the midst of beautiful undulating countryside. Their weekend farm ‘The Pines’ in nearby Lauriston, had been a place for family and friends for 18 years but St Agnes was to become their new passion! 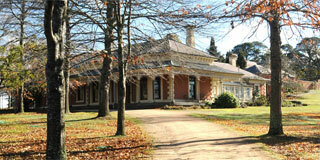 With the guidance of Melbourne architect, Craig Brown, a very good relationship was maintained with Heritage Victoria. With new owners, David, an engineer, and Traudi, who was in tourism, major works were begun, to ensure the future of St Agnes. It was a painstaking and well planned beginning. As caretakers of such an important homestead, renovation had to start from the roof down and the ground up! The Groom’s Retreat, a separate building, where horse grooms could relax, play cards and smoke, was also renovated. This was the beginning of a new role for St Agnes! A bed and breakfast business was begun and there followed weddings and special functions in the formal rooms of the house and even the cellar became a venue for food/wine tastings! Many fundraising events for various charities have been held here .As David is a Rotarian ,the property has been able to accommodate and welcome Rotarians as well as visiting lecturers of ADFAS (a Decorative and Fine Arts Society). Christmas Fairs, musical events,art exhibitions, dinners and wine tastings etc have added to the ambience and excitement of bringing ‘joie de vivre’ back to St Agnes. Since 2012, art workshops have been held in the stables. …so the gentle ‘morphing’ of the property goes on… with so many guests able to enjoy the beauty of a bygone era in a woodland garden setting, so close to the flourishing township of Kyneton and historic Piper st.